Dhruv Ramnath began photographing the followers and ashrams of spiritual leader Sharavana Baba in 2007. 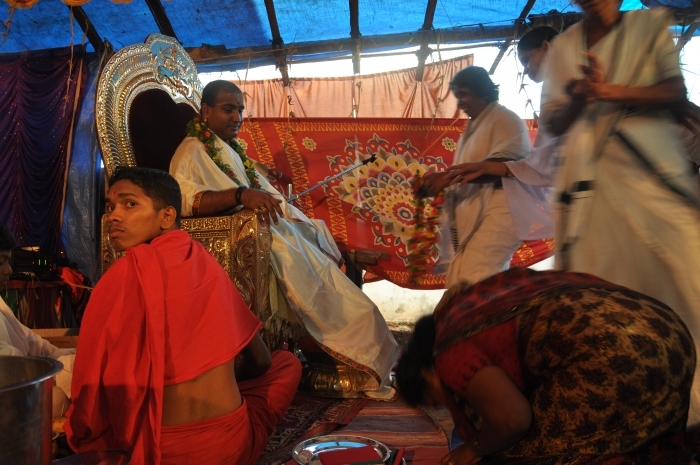 His visual ethnographic project documents how the Guru – who many believe is the reincarnation of the Hindu god Murugan – is the centre of a devotional network that simultaneously venerates him as both Murugan and as Prem Sai Baba, the Indian spiritual master. Here Dhruv explains what he has found over the last 12 years. Since 2007 I have been photographing Sharavana Baba and his followers in his ashrams in London and in Kerala. The Baba, believed to be the reincarnation of the Hindu god Murugan, is popular among Tamils around the world, but especially in London and Southern India. From my years of ethnographic fieldwork, I have gained access to a world in which Sharavana Baba is portrayed both as Prem Sai Baba, a saint from Manya in Karnataka, according to the apostolic literature of the Sai Baba movement. What stands out in the movement’s recreation of the Baba’s persona is its attempt to conflate it with both the Hindu god Murugan and the Indian spiritual leader Prem Sai Baba. This means that he is respected as a self-realised master; in other words a Guru capable of containing and manifesting the ‘power’ of all the gods and goddesses. The devotees that I have be able to capture treasure their relationship with the Baba. For the South Asian diaspora, especially in Britain, and for devotees around the world, he is a Society Guru: he caters to the needs, wants and aspirations of family-minded seekers, those striving for stronger relationships and more responsibilities, and those who believe women should look after the home while men work. The glorification of him as Prem Sai Baba is therefore nothing short of an act of creative propaganda. These photos below not only attempt to deconstruct Sharavana Baba as the elusive Prem Sai Baba and Murugan, but also to offer a visual account of the two ways by which a contemporary Guru-led movement seeks to expand its devotional base. Sharavana Baba’s organisation – the Prem Sai Baba movement “To Come” – is utilising the tools of image worship, the kitschy escapements of Murugan and Prem Sai Baba, as well as the three lands on which the Baba’s cultural and social terrains of bhajan (devotional singing), satsang (the sacred discourse by a self-realised saint) and darshan (a holy meeting with god-men or goddess-women) are noticeably shifting. As a photographer who has chronicled and documented the changing language of his promotional material, I see the movement’s “strategic ambiguity” as a space to locate ideas of secrecy and affect. 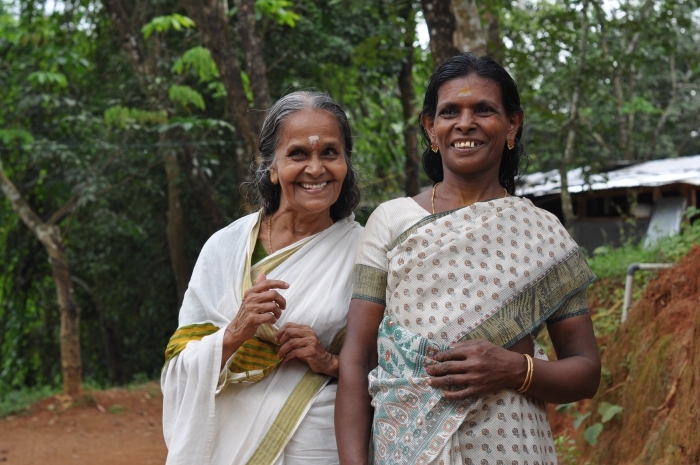 This photographic collection captures the everyday life at his main ashram in Kerala. 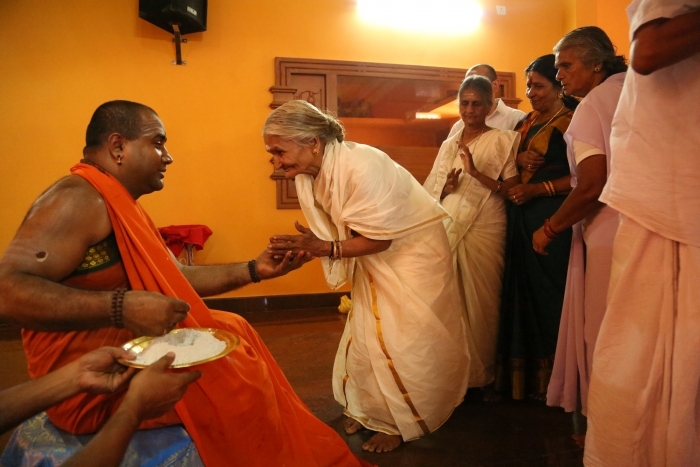 The Guru’s darshan, thirsty listeners, whispers, wandering monks, local Malayalee women and devotion. Dhruv Ramnath is a freelance journalist, filmmaker, photographer, asana practitioner, and researcher. He completed a Master of Arts in Social Anthropology at SOAS in 2018.